Do you consider military intervention in Africa as successful? Focus on the policies in Africa of the UN. “For more than 50 years, United Nations (UN) military interventions have been one of the cornerstones of international efforts to restore or support governance and stability,” (Babcock, 2003, p9). However, the reason this question arises due to the fact that military interventions in Africa have had a higher proportion of failure than elsewhere in the world and in Africa there has been 60 Peacekeeping Operations since 1948 and since the end of the Cold War more than half peacekeeping missions have been in Africa. This essay will argue even though military interventions in Africa have been judged to have “mixed success”, and this is true when looking on the surface of the situation. When looked somewhat deeper, there is far more of a case for it judged to be a failure. As with any trend there are anomalies and for this instance there are successes in the cases of Namibia and Mozambique. However, both Namibia and Mozambique though considered a true success; it is questionable whether it is a success for the UN military intervention itself. The rest, even those who have positive outcomes, known as partially successful, essentially must be judged as a failure. This essay will be divided into four sub-sections: the first section will define the essential terms used in the essay. The second section will argue there has been undeniable success for the UN, in cases as Namibia and Mozambique but questionable if this is due to the success of UN military intervention. The third section will argue that though some argue certain cases are successful; these of which cannot be judged successful as only certain elements are, such as the humanitarian side or the military side. The fourth section will argue that for the majority of cases, military intervention has been unsuccessful, but moreover there is a case they have negative effects on the situation. 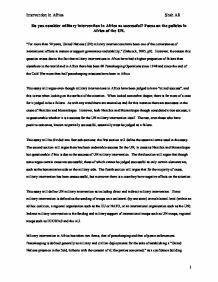 This essay will define UN military intervention as including direct and indirect military intervention. Direct military intervention is defined as the sending of troops on a unilateral (by one state) or multilateral level (within an ad hoc coalition, a regional organisation such as the EU or NATO, or an international organisation such as the UN). Indirect military intervention is the funding and military support of international troops such as UN troops, regional troops such as ECOWAS and the AU. Military intervention in Africa has taken two forms, that of peacekeeping and that of peace enforcement. Peacekeeping is defined generally as military and civilian deployments for the sake of establishing a “United Nations presence in the field, hitherto with the consent of all the parties concerned,” as a confidence building measure to monitor a truce between the parties while the diplomats strive to negotiate a comprehensive peace or officials attempt to implement an agreed peace. Peace enforcement on the other hand is that of “action with or without the consent of parties to ensure compliance with a cease-fire mandated by the Security Council acting under the authority of Chapter VII of the UN Charter.” Therefore, force is able to be used and not just in self-defence. These military forces are composed of heavily armed, national forces operating under the direction of the secretary-general (Doyle & Otunnu, 1998, pp2-3, quotes p3). In terms of peacekeeping, there has been evolution of the term in an effort to gain greater success. The term ‘traditional peacekeeping’ refers to UN peace operations involving the “deployment of military contingents to monitor, supervise and verify compliance with ceasefires, ceasefire lines, withdrawals, buffer zones and relate military agreements,” (Findlay, 2002, p5). They provide transparency, an impartial assurance that the other party is not violating the truce. Such missions have a limited role and therefore a limited life as they a re withdrawn promptly after implementing a truce or peace settlement (Doyle & Otunnu, 1998, p6 and Findlay, 2002, p5). After the cold war there emerged what has been widely recognised as a new form of peacekeeping, known as second-generation peacekeeping. Where peacekeepers once avoided tackling the root causes of armed conflict in favour of containment and de-escalation, they were now mandated to seek just and lasting resolutions for a long term settlement of the underlying conflict. These are multifunctional operations which involve establishing or re-establishing democratic, accountable governance, promoting the growth of civil society and providing impetus to for economic development. Between 1987 and 1994, military forces deployed in peacekeeping operations increased from fewer than ten thousand to more than seventy thousand. The annual peacekeeping budget accordingly skyrocketed from $230 million to $3.6 billion in the same period (Findlay, 2002, pp3-7 and Doyle & Otunnu, 1998, p6). 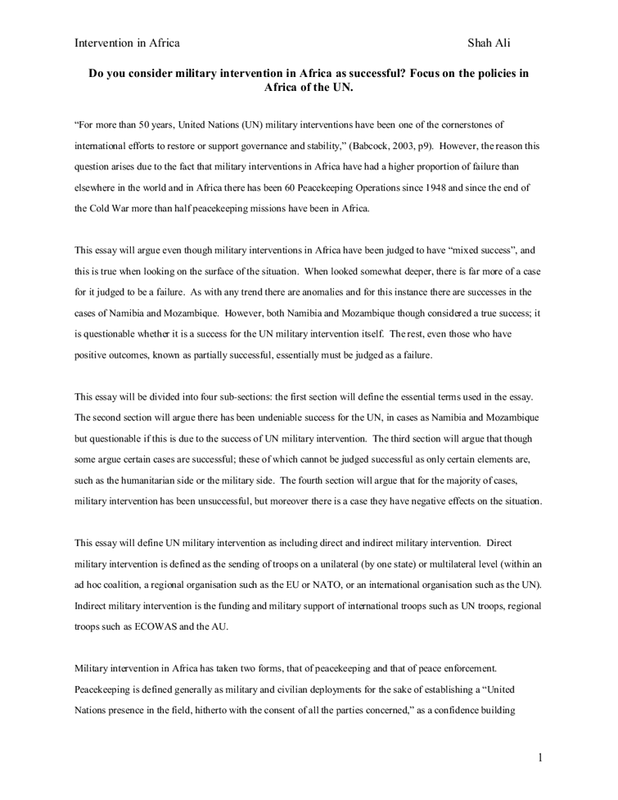 This second section evaluates the successes of military intervention in Africa. Some operations have seemed to have been wholly positive in their outcomes and to have made a clear difference for the better. As relations warmed between the United States and the Soviet Union, it became possible to resolve a number of long-standing regional conflicts. The first and perhaps the most unambiguous of UN successes was in Namibia. There a large-scale operation was launched, designed to facilitate the transition from war to peace and from an authoritarian to pluralistic political system. Admittedly after some shaky moments in the start, the United Nations’ intervention was completely successful in achieving its mandate, both as a peacekeeping force and as an agent of political change, (Macqueen, 2002, p258 and Doyle & Otunnu, 1998, p221). Twelve years after the UN’s peace implementation efforts, Namibia is still largely at peace. There is no ongoing widespread military confrontation, nor is the level of crime or private violence high, (Howard, pp125-126). However, the robustness of the settlement, which enabled it to survive major weaknesses in the peacekeeping operation itself, rested on its unambiguous location in the politics of decolonisation. The idea that colonial territories were entitled to become independent, following an election in which rivals for the control of its post-independence government competed for support from indigenous voters, has formed the bedrock for the creation of the African state system and, in most cases, its implementation has been completely unproblematic. UNTAG subsequently had the task of supervising an apparently non-contentious transition. Forces of SWAPO crossed the border from Angola on the day the cease-fire leading to the transition was due to come into effect, and were bloodily suppressed by South African forces with the consent of the Special Representative of the UN Secretary-General (UNSGSR) who was in charge of UNTAG. The UNSGSR himself, astonishingly, had only arrived in Namibia the day before, and the deployment of the UN force to northern Namibia, where the most difficult problems were obviously likely to arise, had not yet taken place. The fact the whole peace process did not collapse, was due to the continuing commitment of all the major parties, including South Africa, SWAPO, Angola and a united international community. Though UNTAG subsequently got its act together, and some elements of the operation worked extremely well, the achievement of Namibian independence was not a triumph of UN peacekeeping, but a success by default, (Clapham, 1999, p7-8 and Macqueen, 2002, pp107-110). Mozambique, by contrast, is the clearest example of the success of the peacekeeping process itself, accompanied as this was by a large range of co-ordinated diplomatic and humanitarian activities. The war in Mozambique, unlike that in Namibia, was a classic example of the extremely muddled kind of conflict, part domestic, part international, part ethnic, part ideological, and militarily irresolvable. It should have given way to a peace settlement which, no matter how fragile it may be, has so far brought one of the most war-shattered countries in Africa peace, is a remarkable success. In that success, equally, the UN, and especially ONUMOZ, has had a central role, (Clapham, 1999, p9). However, strangely, that place did not include any major role in the negotiation of the General Peace Agreement (GPA) signed between the Frelimo government of Mozambique and its Renamo rival in October 1992. Though the involvement of international organisations in implementing settlements which they have had no part in reaching has understandably been identified as a significant source of following problems, this happens to have been precisely the case in the UN’s most successful experience of peacekeeping in Africa. Still more remarkably, a critical role at this stage was played by an unofficial mediator, the Roman Catholic Sant’Egidio community, while the Italian government provided most of the necessary diplomatic resources. The UN was brought in at a relatively late stage, in order to assure the verification of an agreement which had already been reached in its essentials by the conflicting parties. Once established, however, ONUMOZ was able to assume a core co-ordinating position and produced an undoubted success. There were nonetheless elements in the conflict, notably the relative weakness of Renamo and the absence of external support for continued fighting, which enabled skilled mediation and the effective implementation of the GPA to lead to a peaceful outcome. The same outcome could scarcely be expected, regardless of the quality of the UN operation, in situations in which equivalent underlying conditions were not present, (Clapham, 1999, p9-11). The success of Ethiopia and Entrea was due to it being inter-state and an easy case of traditional peacekeeping, which the UN military interventions are very much capable of. However, the majority of conflicts within Africa and therefore majority of peacekeeping missions are that of an intra-state nature which are much harder to contain and resolve. This third section evaluates those interventions many argue are partially successful. Some operations have been judged to be partially successful because they produce significant positive outcomes or certain elements of the intervention were successful. However, these elements of success do not overcome the overall the failure. The UN’s first intervention in 1960 to the Congo has been described, even though is an overall failed intervention, a military success as the secession of Katanga had been finally ended by the use of force by the UN. However, the military success owes much to the luck that both military commanders and the bulk of the troops were from on country, India. But this is not to say that it would not have ended anyway when confronted by a more organised and determined central government and amidst the hostility of independent African neighbours. Beyond the issue of Katanga the impact of the UN appeared somewhat small indeed. With or without the UN presence it is likely that Mobutu, exploiting the self-interest of the west, would still have come to power and maintained his grip as he did into the late 1990s. Therefore to call this intervention even partially successful due to its minor military success is absurd. Given when, the UN efforts did nothing to improve the future lot of the Congolese people. Nor, given the anger and tensions generated in New York, did the intervention serve any large institutional good (Macqueen, 2002, pp259-260 and Durch, 1993, p347). The mission for the referendum in Western Sahara, which, ten years after being established, oversaw a situation in which the referendum seemed further away than ever. However, it is argued that the peacekeeping function of the operation, narrowly defined, had been successful. On the other hand, a basic principle of peacekeeping is that is should take place with the consent of the parties in conflict. However, the operation did not enjoy the consent of all local parties. Morocco really only consented to host a successful referendum that would destroy POLISARIO’s claim to political legitimacy, and for all practical purposes withdrew its consent when the outcome of the referendum could not be assured (Macquuen, 2002, p261 and Durch, 1993, p430). In the Central African Republic multilateral intervention had some success for as long as foreign forces were in position. Developments after their withdrawal, however, when the underlying conflicts in local politics and society re-emerged as strongly as ever, indicate that the impact was not enduring. In this case it is not sure whether the UN brought any unique qualities to the situation. The intervention had originally been one of a group of Francophone states mobilised by France itself. The shift to UN control did not even involve any fundamental change in personnel. In the CAR the purpose of the United Nations appeared to be mainly to provide convenient and timely relief to France as reservations grew in Paris about the national commitment (Macqueen, 2002, pp288-264). Macqueen argues in Somalia, UNISOM I, that the humanitarian role of the international military intervention, however imperfect, rescued many thousands of Somalis from famine and improved humanitarian conditions substantially and therefore to a certain extent a success. However, if this was the case all 2nd generation peacekeeping missions would be a success as to a certain degree all operations have saved lives as effectually one is arguing it is successful compared to total inaction, which is impossible to predict. Inescapably the UN failed in Somalia if the judgement is made in terms of its own mandates to secure peace and restore government, (Macqueen, 2002, pp218). This fourth section evaluates the unsuccessful interventions, which the majority are, and outline how and why they are unsuccessful. The overall failure of UN military interventions in Africa is somewhat predictable considering that no major African peacekeeping operation, whether undertaken by the UN or by anyone else, has met the basic conditions or principles of peacekeeping. Such principles include that it should take place with the consent of the states in conflict, with the peacekeepers acting as impartial brokers and force only used in self defence. The most significant is that direct conflicts between states in Africa have been relatively rare and only the UNMEE operation involving any real commitment of resources, which evidently contributes to a much higher ability to succeed as the UN performed particularly well in resolving the conflict between Ethiopia and Eritrea where it was basic classic peacekeeping providing a large interposition force between the two sides in 2000, (Clapham, 1999, p3). The issue of unclear mandates and poor logistics have come to be integral in many failed peacekeeping operations. Unclear mandates often are the outcome of political compromises, not least in relation to the parties, as does a blurred borderline between peacekeeping and peace enforcement, (Doyle & Otunnu, 1998 p212). A particular danger is involved when a peacekeeping operation gradually turns into peace enforcement, which is known as “mission creep”. To many observers Somalia was infamous above all for mission creep. This was alleged to have occurred both in relation to the mission as a whole, including the UNITAF and UNOSOM II phases, and in relation to the use of force. The UN moved from traditional peacekeeping in UNSOM I to quasi-peace enforcement in UNOSOM II, and back again to peacekeeping, punctuated by the presence of a non-UN multilateral coalition force. For the first time since the Congo in the 1960s, a UN force was drawn into sustained armed conflict with one of the parties to a civil war, abandoning its impartiality and irretrievably damaging consent to its presence (Findlay, 2002, pp204-205). A peacekeeping force gains and retains its acceptability because it is impartial. If peacekeepers exceed their jurisdiction and move beyond their right of self defence, the failed operations have shown us that they will almost inevitably compromise their neutrality and become another part to the conflict. In Somalia, according to some observers, UN intervention contributed to a significant growth of support for Aidid’s Somali National Alliance. Aidid’s supporters soon roundly condemned UN “colonialism”, (Doyle & Otunnu, 1998 p167 & pp8-9). In a number of operations, there have been failures to contain the conflict, as massive population displacements have not simply been an unplanned consequence of violence but have been the direct objective of one or more of the conflicting groups. As a direct consequence of such mass population displacements, recent humanitarian emergencies have tended to be international in nature, drawing in neighbouring and near by countries, regional organisations and the international community as a whole. Liberia provides the clearest example for this tendency. Beginning in 1989 as a relatively localised conflict but soon swiftly engulfed the whole nation, provoking massive internal displacements and exodus of refugees into half a dozen West African states. Within two years the conflict had spilled across the borer into Sierra Leone, contributing to the deepening political and economic crisis there. The collapse of the Liberian state triggered the intervention of a multinational military force under the auspices of ECOWAS, supported by the UN as well as the deployment of a smaller UN observer mission. While questions have been raised regarding the motivation and impact of Operation Turquoise, where France, authorised by the UN, set up a safe region in Rwanda, there is considerable evidence to suggest that this initiative helped to limit the scale of the refugee exodus to Burundi and Zaire (Otunno & Doyle 1998:225). A major issue of the unsuccessful nature of military interventions in Africa is that of long term success. In an era of 2nd generation multidimensional peacekeeping, interventions without long term success must be declared unsuccessful. The task of post-conflict reconstruction and reconciliation is itself inseparable from that of conflict prevention. A country that has experienced one civil war may soon be confronted with another if efforts are not made to restart the development process, to develop a pluralistic political system, and to build new and effective institutions. One might regard the UN observation mission in Angola in 1991-92 as a success in that free and fair elections were held under its auspices. However, the elections were shortly followed by a renewal of civil war, largely undoing what the UN had achieved and prompting a renewal of UN diplomatic efforts, (Doyle & Otunnu, 1998, p229 and Diehl, 1996, p683). One also has to look at this question from different perspectives. Most notably the African viewpoint on many of the UN actions and interventions will not coincide with that of the UN or even the wider international community. Conflicting states may be less amenable to UN military intervention if they recognise that such action only temporarily freezes the status quo and delays the resumption of serious conflict between the parties, as seen in Angola; the party most adversely affected by the status quo may be very hostile to UN action. More significantly, repeated conflict between the same pair of states over time enhances the prospect for escalation to war. Therefore the UN interventions are not just unsuccessful but in theory may be a contributing factor to far worse situations such as war. If the UN military interventions lead to short term success, without the long term policies, it may not stop the protagonists from returning to military force at some point in the near future and therefore that success would have no real significance, (Diehl, 1996, p684-686). Humanitarian organisations have traditionally been wary of the military, given the very different objectives and working methods of the two institutions. However, since the end of the Cold War and the evolution of peacekeeping to multidimensional 2nd generation peacekeeping, the two have found themselves working closely together. This relationship causes problems which can lead to failed interventions. Firstly, the degree of support available from the military in complex emergencies is unpredictable. Member states are not normally prepared to put their troops, equipment, and relief supplies at the automatic disposal of humanitarian organisations. Also, from a realist viewpoint, states will not want to intervene in a possibly dangerous situation if they do not have vested interests in the situation. Secondly, there are management difficulties of humanitarian activities. Who, for example, decides how much relief should be given and where and at what point is it too hazardous for continuation. Thirdly, the assistance that the armed forces can provide is limited in nature. Despite the acknowledgement that the military has unrivalled ability to deliver large amounts of relief at very short notice, irrespective of the distance or the terrain, they lack skills needed to deal with counselling victims of sexual violence and such. Fourth, the involvement of armed forces can be a threat to the traditional neutrality and impartiality of humanitarian assistance. Though this threat is limited in situations such as Namibia and Mozambique where the conflicting parties have stopped fighting and so there is a general consent to the UN’s role and presence. However, in situations of active conflict, where one or more of the warring parties refuses to respect humanitarian norms, and especially when troops are obliged to resort to the use of force, the risks are far greater. This can be seen most clearly in Somalia, (Doyle & Otunnu, 1998, pp223-224). In conclusion, the UN military interventions in Africa cannot be seen as a “mixed success”, as most have described it, and more so of a general failure. The success stories for UN intervention in Africa, although seem true on the surface of the situation. When analysed somewhat deeper, there is far more of a case for it judged a success but not one of UN military intervention. Those argued to be partially successful, are so due to certain positive outcomes or a certain successful element of the intervention such as humanitarian or military element. However, when this element is analysed in the context of the whole intervention, it is not significant enough for it not to be fundamentally a failure. The majority of military interventions in Africa have been unsuccessful by using peace enforcement due to unclear mandates and lack of resources for success while not enough emphasis on the long term success of the interventions, which may actually have a negative impact on the long term situation. Maybe a different approach is needed. Roberts argues more time is needed for a gradual change in values and diplomatic practise such as the end of the Cold War was due to the slow erosion of communist beliefs, (Roberts, 1993, p446). Diehl Paul F., Jennifer Reifschneider, and Paul Hensel (1996). "United Nations Intervention and Recurring Conflict." International Organization 50: 683-700. Diehl Paul F., and Chetan Kumar (1992) United Nations Peacekeeping Operations: Some win-win Applications. London, Acdis. Durch William (ed. ), (1993) The Evolution of UN Peacekeeping: Case Studies and Comparative Analysis, New York, St. Martin’s. Goulding, Marrack (1999) ‘The United Nations and conflict in Africa since the Cold War’, African Affairs, 98:391, 155-66. Goulding, Marrack, (1993)‘The Evolution of UN Peacekeeping’, International Affairs. Howard Lise Morge, ‘United Nations Peace Implementation in Namibia: The Causes of Success’, International Peacekeeping (9:1 Spring 2002). Macqueen, Norrie, United Nations Peacekeeping in Africa since 1960, Pearson Education, Longman, 2002. Otunnu Olara and Doyle Michael, Peacemaking and peacekeeping for the new century, Rowman and Littlefield 1998. Roberts Adam, (1993) 'Humanitarian War: Military Intervention and Human Rights', International Affairs Vol. 69 No. 3 pp. 429-450.
posts outside Spain in order to avoid uprisings against the new government from the right. As a result of these measures, Spain's economy was severely damaged due that the wealthy people started taking huge amounts of capital outside the country. By Israeli estimates, only thirty of those killed were terrorists. For ten days, the PLO then unleashed artillery fire against the upper Galilee. Although only six Israeli citizens were killed, many Israelis were shocked and stunned by the PLO's capability to sustain such an attack. Millions of Yuans 6,810 16,790 29,020 PRC Expenditure in Percentages of Total Budget: As is shown on the table in 1950 the percent of money which was taken away from the budget is 41,5 %. This is almost half of the entire Chinese budget. Continent-wide expansion seemed inevitable. Texas, which had declared its independence from Mexico in 1835-36 (see TEXAS REVOLUTION), was annexed in 1845. Then a dispute with Mexico concerning the Rio Grande as the border of Texas led to the MEXICAN WAR (1846-48). The Constitutional Convention of 1787 A chain of meetings, beginning with one between Virginia and Maryland in 1786 to solve mutual commercial problems and including the larger ANNAPOLIS CONVENTION later that year, led to the CONSTITUTIONAL CONVENTION in Philadelphia in 1787. She concludes that it was this "shared culture, this cross-fertilization of ideas extending beyond local and regional communities ... [that] 'created the conditions for new ways of coping and knowing'" (11). She recognized a "creativity" in ordinary people, not only to survive but to rebuild their lives in a new and imaginative way. And eventually in 1953 he introduced the first five year plan. The emphasis of the plan was on state directed growth of heavy industry. A basis for this was already in China since the GMD government had establish a National Resource committee which had taken control of industrial investment policies. Francisco Madero became the president of Mexico in the country's first "democratic election in 30 years' (Chronology, Mexican Revolution 1910-1920). The election placed America into a state of paranoia and fear due to the assumption that Madero would not protect the America's investments.